Text of the Day: Today's text is longer and oh-so-eerie, a perfect choice for the weekend: the classic Gothic horror novel The Beetle by Richard Marsh (1857-1915). Published the same year as Dracula, The Beetle was at the time considered the more popular and sensational of the two supernatural thrillers. Download an unabridged narration from Librivox.org. Ooh, that is beautiful, eerie artwork! I'm glad you think so, too! 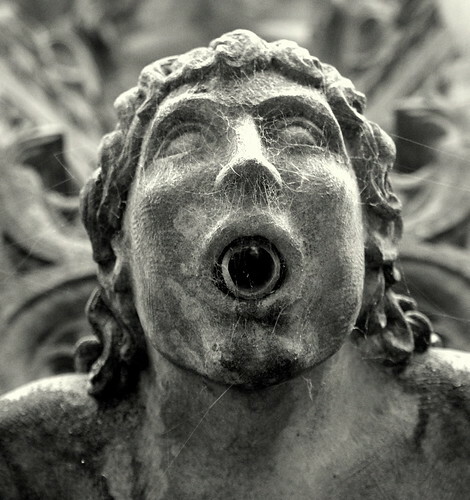 That gargoyle picture has a true horror about it... and that chap's artwork is beautiful, isn't it! Thank you! Yay! I'm so glad you liked the photo and the artwork, as well. The artwork is *breathtaking*. WOW! Isn't it? I'm so glad you liked it, too! What gorgeous artwork! I love the Halloween pieces, but his scifi stuff is wonderful, too. You're so right: the SF artwork is equally amazing. I hope you like The Beetle! I very much enjoyed it. And by artwork, I actually meant the photo. Just looked at the artwork--AWESOME! Isn't that artwork amazing? My jaw is still hanging open. I'm so glad you liked it, too. Oh it's glorious...I love art that really tells a story. For more art that really tells a story, you should check out Justin Gerard. He's actually done a lot of artwork on The Hobbit and lots of other cool fantastical things! Thanks for this fantastic link! Wow. I really love this artwork. Thank you again for a fantastic experience in Charlotte. What an amazing day! Kudos to you, and thanks again for inviting me to be involved. I wouldn't have missed it for the world. By the way, I'll be posting the complete Harry Potter Fest hourly schedule for Oct. 28 here tomorrow (that is, Monday). Yay! We were so honored to have you at our conference and it was fantastic to see you! It's not everyone who can claim they have a Potter Pundit living up the road. Aw, thank you! :) It was a joy. I do hope there will be another next year. I'd be quite interested in submitting a paper proposal for a panel, but even if I didn't, I'd love to come and see the other presentations! The L-R schedule is up now here. Would you mind forwarding the schedule - or the link to it - to the PotterWatch folks? Everyone's invited! :) Thanks! That photo of the fountain(?) is freaking me out. I know! Me, too. Isn't it stunning? And spooky? I think the cobwebs make it especially haunting.